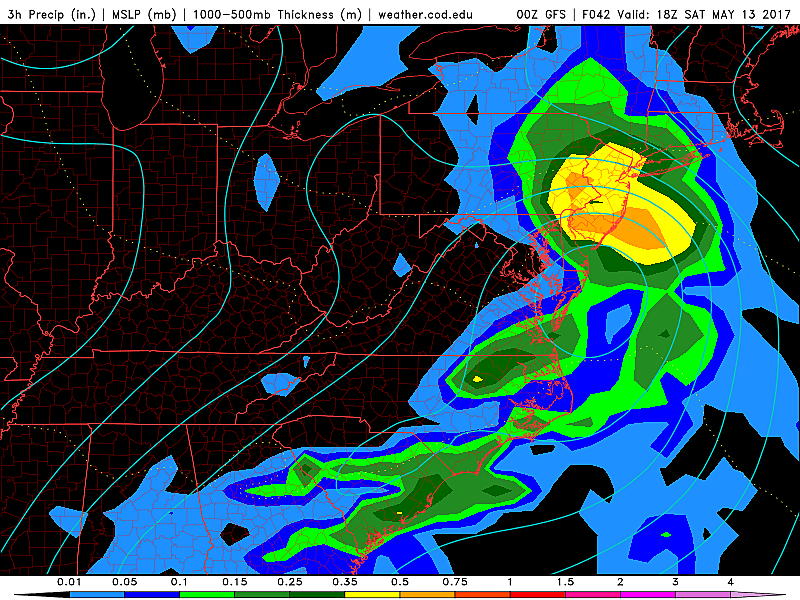 It's going to be a very wet start to the Mother's Day Weekend across the Garden State. Happy Rain Eve! 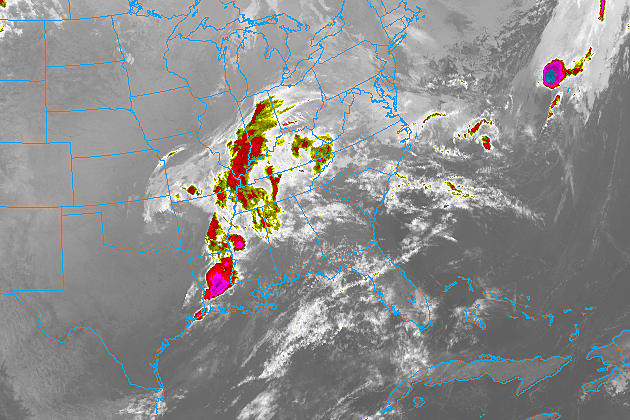 A strong storm system has been digging across the United States this week, and will slide along the Atlantic seaboard as we enter the weekend. (You can call it a "nor'easter" if you really want.) Plenty of moisture to make for washout conditions across the entire state. The really wet day will be Saturday, with other storm system impacts scattered through the rest of the Mother's Day Weekend. I was pleasantly surprised to discover the forecast for Friday daytime looks dry across New Jersey. In fact, clouds have broken apart overnight, so we will enjoy a few breaks of sunshine Friday morning. Clouds will thicken up again Friday afternoon, limiting our daytime warming quite a bit. High temperatures for Friday will only reach the upper 50s to lower 60s — at least 10 degrees below normal for mid-May. The leading rain bands of our impending storm system may encroach upon South Jersey Friday evening, but most raindrops will hold off until after midnight Friday night. 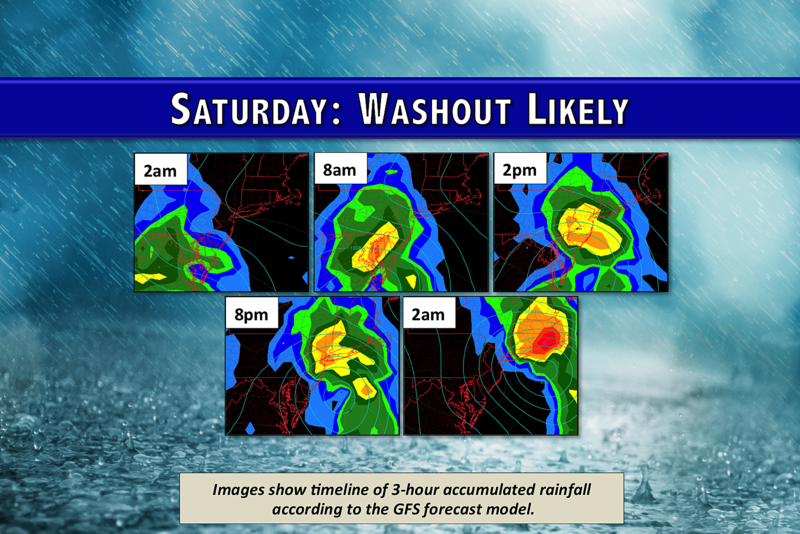 Rain will spread from southwest to northeast between about 2 a.m. and 8 a.m. Saturday. It's probably going to rain at a steady clip all day. Scattered pockets of heavy rain are a good bet too, especially Saturday afternoon. As the storm system exits, rainfall should begin to taper off around 8 p.m. Saturday. Most (if not all) rain in New Jersey will come to an end by 6 a.m. Sunday morning. The latest models have backed off on rainfall totals a little bit. I'm still thinking a widespread 1 to 2 inches of rain is likely across New Jersey, with locally higher amounts where it really pours. Such downpours are enough to cause "the usual heavy rain problems," including poor visibility, ponding on roadways, and flooding of low-lying areas. Severe weather and even rumbles of thunder are unlikely — it's just going to be a very wet day. Combined with cool temperatures (mid 50s) and a brisk wind (gusts to 30 mph), I'm going to call it yucky. Again, forecast models show subtle improvements in the coastal flooding threat, in the form of slightly lighter easterly winds. We're still going to see areas of "minor" flooding along tidal waterways, at the times of high tide. But timing, the storm's track, and wind's trajectory are really playing in our favor here. With only 1 to 1.5 feet of surge expected, coastal flooding should not be that big of a deal. High tide on the ocean on Saturday will occur around 10 a.m. and 10 p.m. on the oceanfront. Back bays experience high tide up to 3 hours later than the Atlantic Ocean. As mentioned above, most (if not all) rainfall should end by the time you way up Sunday morning. Clouds will break apart, leading to shots of sunshine throughout the day. And we will warm up as a result, with highs soaring into the upper 60s. That's 10 to 15 degrees warmer than Saturday, and close to normal for mid-May. Two weather issues remain for Sunday, however. The first will be a continuing gusty wind, still up to 30 mph at times. So the day might feel a bit blustery at times. The second minor weather problem of the day will be another chance for showers on the backside of this system. That possibility will crop up sometime Sunday evening. Skies will continue to clear on Monday, but the gusty wind will still be a problem — possibly up to 40 mph. Highs will try to make it to 70 degrees, but that northwest wind will likely prevent that. Lighter winds and abundant sunshine on Tuesday will push thermometers into the 70s across most of New Jersey (even along the coast). And then on Wednesday and Thursday, as southwesterly winds pump in very warm air, the "summer switch" gets turned back on. 85 degrees will be a good possibility! I'll likely post a quick weather blog update by Saturday morning, as our soaker storm system draws closer. Stay tuned, stay dry (if possible), and stay safe this weekend!